The Rt. Rev. 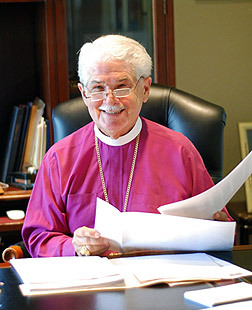 Jack Leo Iker was consecrated Bishop Coadjutor of the Episcopal Diocese of Fort Worth on April 24, 1993, and became Diocesan Bishop on January 1, 1995. Bishop Iker holds honorary Doctor of Divinity Degrees from Nashotah House Seminary, the University of the South, and the General Theological Seminary. He has served on the Boards of Nashotah House, Forward in Faith/North America, and the American Anglican Council. In 2016 a collection of his sermons and addresses, Consider Your Call, Brethren, was published by the Parish Press. In his free time, the Bishop enjoys long walks, reading, and beach visits.